Managed from Catalog > Downloads. Global Downloads explained in this guide can be added to the any product or several products on the product's edit page Files Tab. WebriQshops supports multiple downloads (files) per product! Also you can create download manually on that page too. Red color of Shared Download indicates missing file. To add file: click on 'empty' image the Resource Library popup will appear. Here select existing or upload new file from your local PC. Name: The download name as it will appear in the front-end. Activated: Download will be activates on the event selected. Before Order - Download is activate before order is placed and available for download at product page on Storefront. Max downloads: the maximum number of allowed downloads for the customer. Once the user hits this limit they will no longer be able to download the file. Expire days: Count of days from date of purchase. Download expire date works in the same way; if you define a number of days, after that days the download will expire. Sort Order: Sort Order set's the order of which the Shared Download will be displayed amongst others. 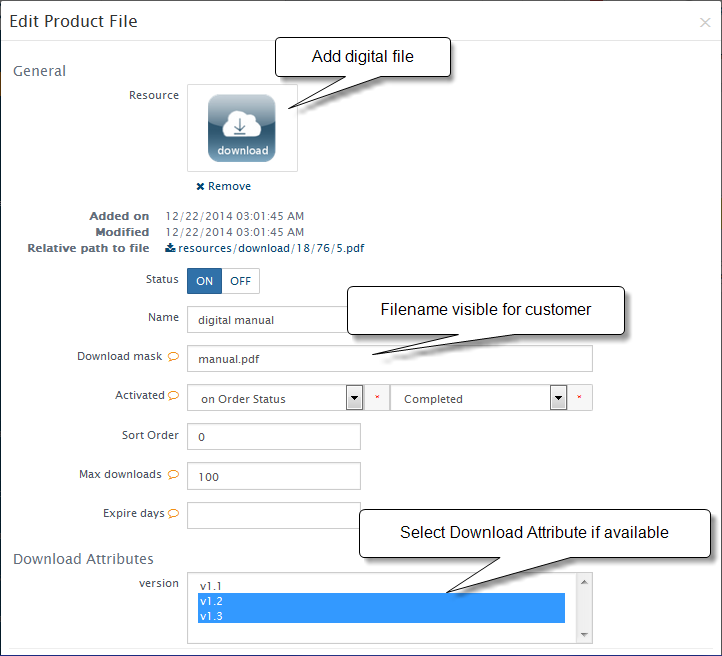 To add Shared download (download file) to product locate the Files tab on product's edit page. For any Shared Downloads you able to add Download Attributes. Just select values for Download Attribute you want to add and save shared download. Download Attributes developed for internal use but You able to alllow customers to see it in the Download section Storefront using Download Attribute's setting 'Show to Customers'. Download should be added to product to allow customers to order them.